Earth MineChem is a leading supplier of quartz grains, quartz pebbles, and quartz powder in Rajasthan India. Quartz Grains a crystal form of Silica is found in various forms like Sand Stone, Quartz Sand and Quartzite. 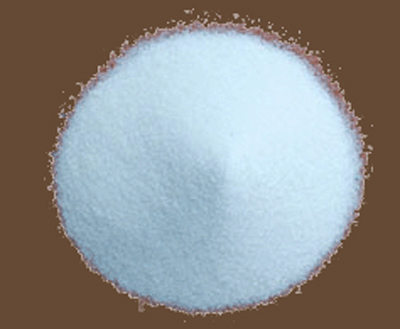 Quartz Powder in India supplier Quartz Powder in India exporter Quartz powder in India manufacturer. Quartz grains are able to record a large number of marks, making them ideal for bringing the past environment back to life. Quartz Powder are used spread over a very wide range of industry where functional roles of it are also varied, quartz powder is used as filler in porcelain, sanitary and ceramics. 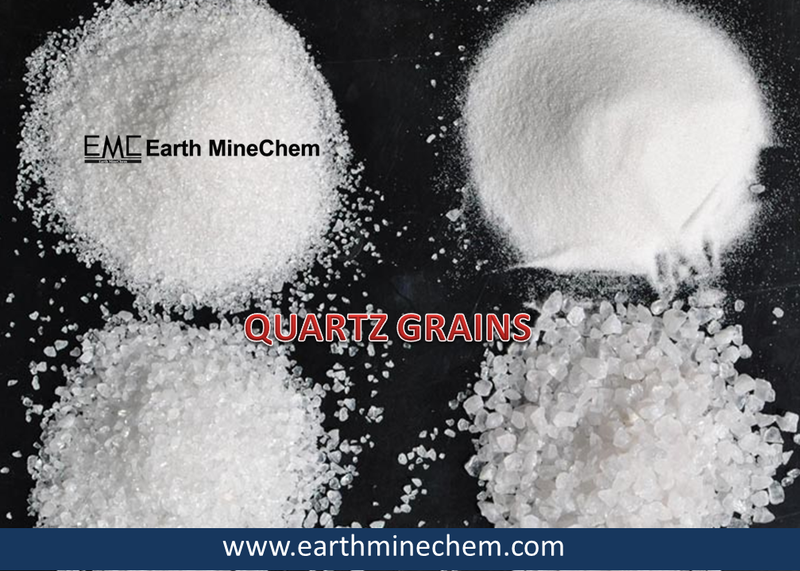 Quartz Grains are mostly used lining refractories in induction furnaces, as a flux in smelting operations. Our Quartz Powder is available in all forms from lumps, Grains & fine Quartz Powder of 100,150,200, 250,325 & 500 BSS mesh. All particle size distribution and possible fractions, etc. are prepared strictly as per the specification of the clients. Earth MineChem supply high quality Quartz powder in India processed in iron free grinding mills & produces various standard grades of Quartz Powder for different industry applications. 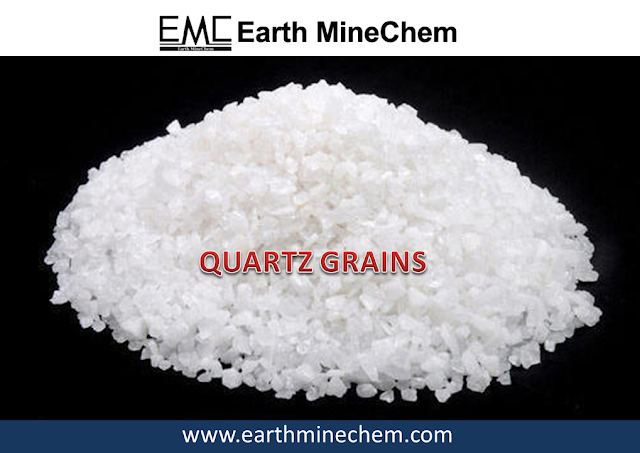 Quartz Grains are known for their impurities free content, high strength, low heat expansion rate, affordable price. White Quartz Grains are widely used in various applications like paint industries, paper industries and rubber industries. We provide Quartz Grains in various sizes, shapes. Earth MineChem are manufacturing and supplying superior quality Quartz Grains. These grains available with us in known for uniformity and high purity traits are processed from excellent form of quartz. If you purchase is we are the manufacturer of both Grains & Quartz lumps so we can supply you material at regular supply. Quartz Grains are able to record a large number of marks, making them ideal for bringing the past environment back to life. Earth Minechem provide smoky quartz powder, glassy quartz powder, snow white quartz powder milky quartz powder and Quartz Stone Powder offered finds application in sandpaper, in optical applications, in construction foundry chemical, in sandblasting and making of some computer parts process employed in heavy industries. "Quarz," a Slavic origin. Quartz Powder is the most common Minerals on the earth. Quartz of all minerals is composed of silicon dioxide, or silica, SiO2. It is an essential component of igneous and metamorphic rocks. Earth Minechem is well-known manufacturer, supplier and exporter of minerals in Rajasthan India. 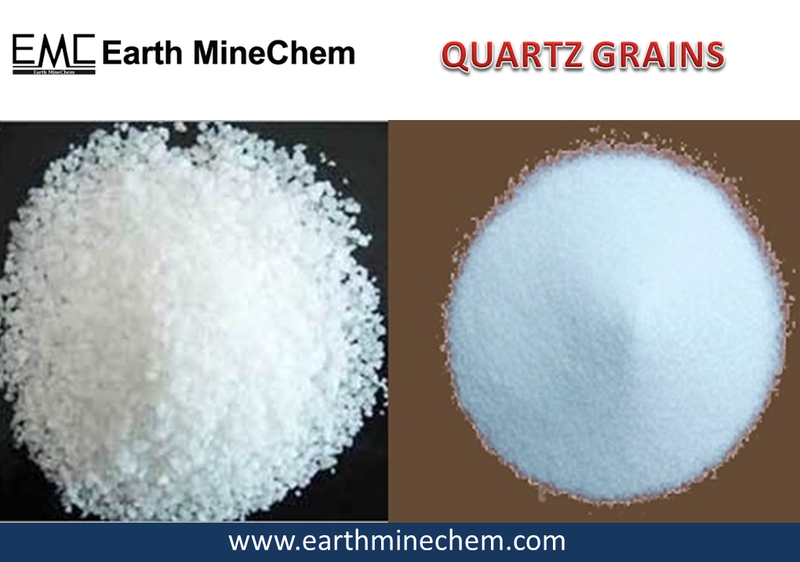 Earth Minechem are best supplier, exporter and manufacturer of silica quartz powder in India. The offered item is created in adherence with stringent quality standards and mainly used detergent powder, ceramics, water softening, glass and paints as well as paint creations. The size varies from specimens weighing a metric ton to minute particles that sparkle in rock surfaces. Earth MineChem is a Fine Quality Quartz Powder Supplier in India. We supply the premium quality products like Quartz, Talc, Sandstone and Dolomite in the market. We believe in best customer service and long term relationship with the buyers. Earth MineChem is known for the customer relationship and we work closely with them and fulfil their requirements. Earth MineChem is Manufacturer, exporter in several industries and customers with multi products. We produce best quality chemicals and minerals in our plant located in the state of Rajasthan. We supply the best quality Quartz Powder in India. 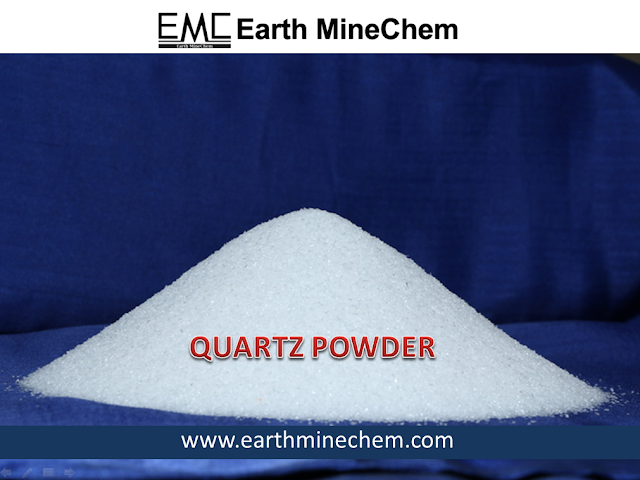 Earth MineChem offer Quartz Powder at very affordable price. Earth MineChem is engaged in manufacturing quartz powder, Calcite, Dolomite, Talc etc. Earth MineChem is always happy to provide the best quality products with the best services and we provide you best support as much as we can make easier for them. Earth MineChem is supported by a team of qualified professionals who well guided under the best leadership. We are Manufacturer of Quartz Powder in India. We manufacture and supply the good quality minerals in the reputed market for the long term business and relationship. Earth MineChem has been supplying minerals to many industries and quality of our products is approved and always found satisfactory. optimum quality Quartz and higher efficiency. Earth MineChem providing various types of Minerals. We are offering a wide range of quality Natural Minerals Powder and best Quartz Powder in India. These minerals are carefully extracted and processed by our experts. The range provided by us is applicable for various commercial purposes. Our products are widely acclaimed for their optimum quality Quartz and higher efficiency. 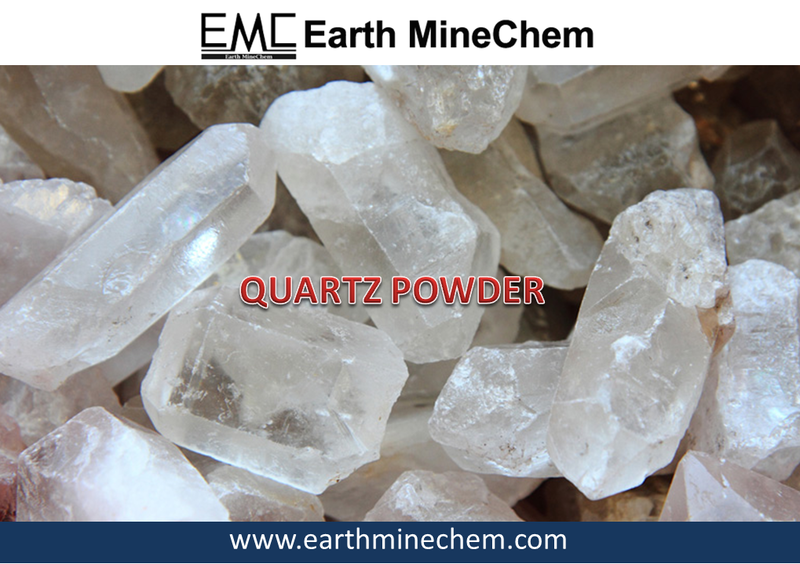 Earth MineChem is supplier of Quartz Powder in India. 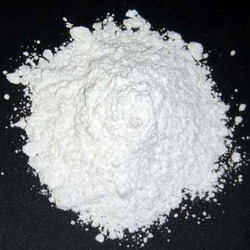 We introduce one of the prominent organizations, engaged in providing best Quartz Powder. The offered powder is processed at our processing unit by using advance equipment & techniques. We provide this powder in the form of snow white quartz, super semi, milky white and semi white. Earth MineChem is manufacturer of Quartz Powder in India. The offered powder is used for fiber glass, insulator, sanitary ware, paint, semi conductors, etc. This powder is processed using excellent quality quartz lumps with the help of latest technology. Quartz powder is being used in foundry, glass, ceramic, semi conductors and paint industry. 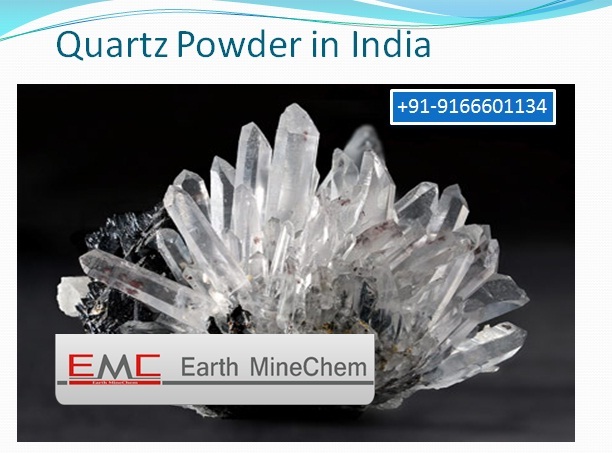 Earth MineChem is offering mineral Quartz Powder in India. We introduce ourselves as an exporter, wholesaler & supplier of Quartz Powder. The offered range of mineral powders is separate on the basis physical properties. High purity quartz becomes a strategic raw material for the industries like Ferro silicon, Glass, Ferro alloys. We offer the most affordable prices in minerals powder. This powder is known for its high bulk density, insolubility in water.